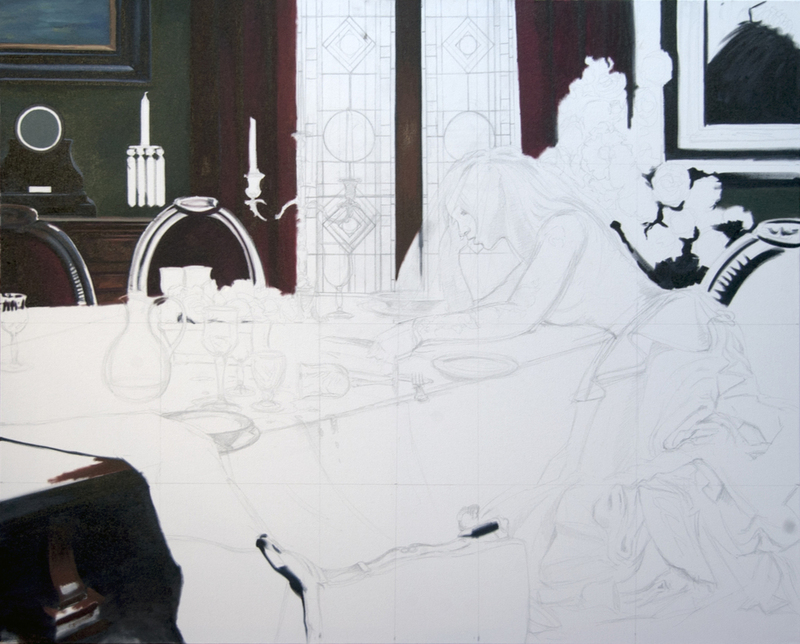 For this painting I started with a very rough pencil sketch laying out the composition and addressing the narrative. Next stage is to scan the drawing into my computer and start working out the values - darkest and lightest. Still in photoshop, I've begun to work up the colors and lighting while keeping an eye on the component details. 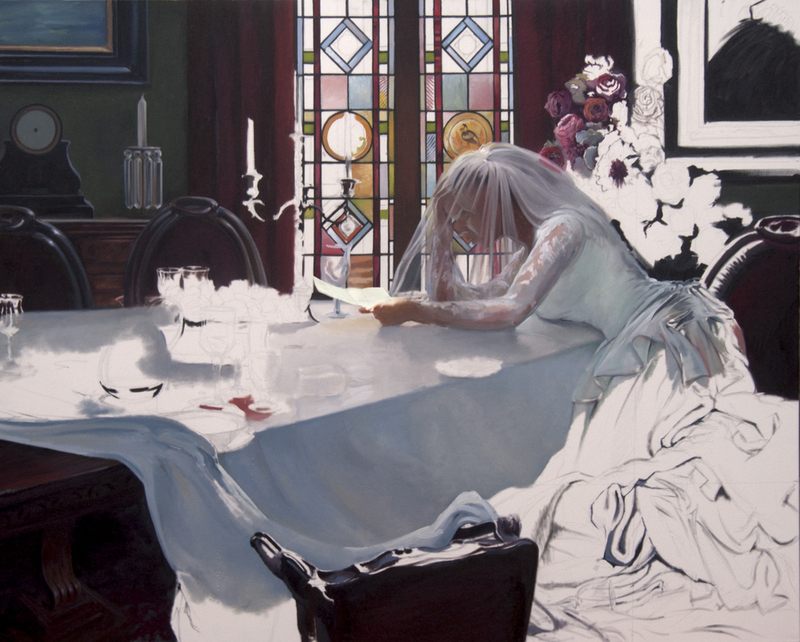 At this stage i'm now working up some of the final details in the folds of the dress and have "changed out" the placeholder for the stained glass windows with one referenced from the internet- victorian. Added framed paintings on the wall (upper left is a painting i did of water lilies) Now I have to work out the "still life" on the table. A painting within a painting. I'm working out the placement of the elements on the table. This is beginning to feel close to what i'm after. A fair amount of work went on since the last image. Changed out the candlestick for a candelabra and white candles. Added a mantel clock which is a storypoint. Finished the layout for the tabletop. I'm going to call this complete, but i may still play around a bit with some of the elements when I actually get down to the painting. Looking closely you can also see the grid overlay which will enable me to transfer this drawing to my canvas. The final painting will be 4' x 5'. Started the actual painting. My wife took this photo so you can get a feel for the scale. First order of business is to lay in my darkest darks. Some of the areas under the table go all the way to black. This session took about 7 hours. I'm already seeing some drawing issues with the chairs- easily rectified. Painting the veil and the see thru material on her sleeves presents it's own issues. 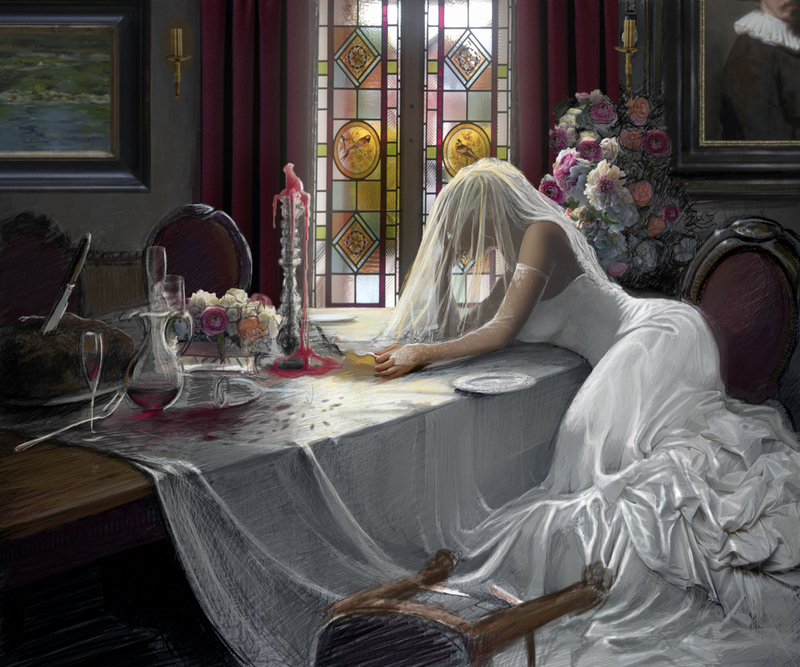 Do I paint it as if it's just skin and then layer the veil material over or paint the image as is from the get go. I chose the straight ahead approach. I've also gotten a start on the stained glass. This will enable me to paint the "mottled" portions seen thru her veil and to work my edges into the background as I paint. Also the varying colors of light coming through the windows will play on both the table and on Miss H.
In reality this is more like Day 5. Limited time to work so this is several shorter sessions. Made some progress on the stained glass. Re-drew her arms and finally got some of the tablecloth painted in. Starting to get a sense of the lighting and mood. Darkened the wall and flowers. In the midst of darkening the draperies as well. I will be taking down the levels on the paintings on the wall as well. This should increase the contrast and help to strengthen the effect of the lighting. Played with the look of the colored light coming through the stained glass onto the tablecloth.. still needs work but I think it's beginning to read. Also emulating the satin is quite the deal. Treating it a little like metal. 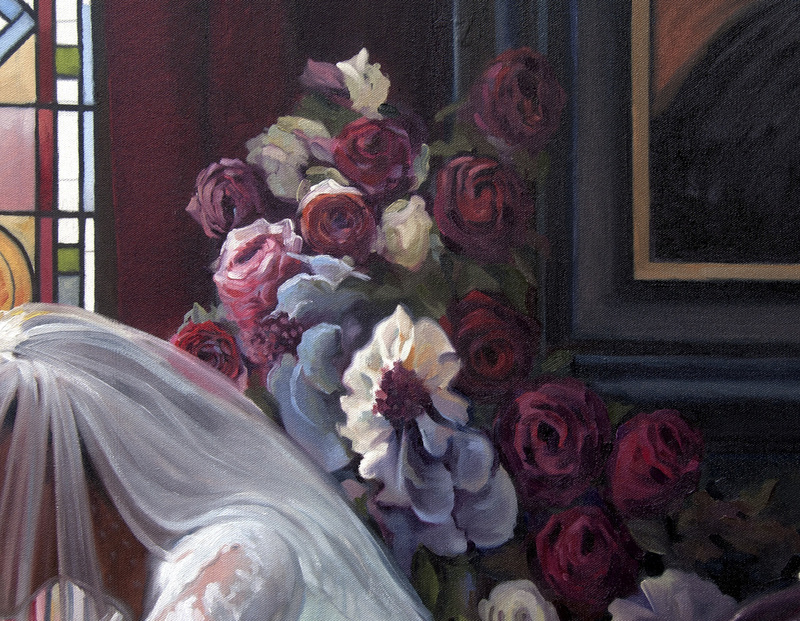 I thought i'd include this detail to show some of the brushwork. In spite of the "photorealistic" nature of this painting i'm trying to keep the brushwork loose wherever possible without sacrificing the details important to the narrative. Wedding dress almost done. The quality of the reflected light on the Satin is starting to work. The next step is the tabletop still-life.